Several friends of mine have neither the inclination, time, nor space to grow their own vegetables, so they join a CSA to be part of the local food system. Inevitably, a few weeks in, they regret the decision. "What do I do with a huge basket of mixed greens?" they moan. Or, "Five butternut squash? I don't know how to cook squash!" The truth is that the beginning gardener often feels the same way. We're used to buying whatever vegetables suit our fancy or are mandated by our favorite recipes, and we don't know how to make a salad when we realize that lettuce and tomatoes are never in season at the same time. On a similar note, we might want to start a garden, but we don't know which vegetables are within our reach and which ones are the domain of experienced green thumbs. How can we even start when the whole endeavor looks so daunting? It's much easier to pick up some organic produce at the grocery store and figure we're doing our part to save the world. Although I know that many of our readers are long time gardeners and cooks who use in-season produce without thinking about it, I also suspect that others of you are afraid to put the first plants in the ground because you just don't know how to go from seed to gourmet feast. This week's lunchtime series launches a new facet of this blog geared toward giving beginners the information they need to start a quick and easy garden and then to enjoy the bounty. I hope that you experienced gardeners and foodies will read along and add your own advice on which plants are easy to grow in your neck of the woods, and on simple recipes you use to produce delicious, in-season meals. Don't have time to put in even the smallest garden? Our microbusiness ebook will show you how to make a living in just a few hours a week so you can spend time doing what really matters. Oh, excellent - I'm looking forward to this week's lunchtime series! I figure I'm kind of a "half-and-half" person on this topic. Although I do (usually) keep a garden (and can a lot of pickles and tomato products - someday I'll have a freezer), I still find myself picking up some things (like spinach and lettuce) from the store . . . and then being rather annoyed with myself for giving in. A little guidance would be most appreciated! I suspect this week's series will be pretty basic for you, but I could be wrong! Feel free to add your two cents about what you find difficult and easy on later posts. What a great topic! This is something I've thought would be wonderful to write about... if I had any experience at all. It seems like the first few gardens are just kind of a "Hi, nice to meet you" kind of thing. I planted cilantro and tomatoes together in hopes of making fabulous salsa, and there were bell peppers, chives and onions in the ground to add to homemade fajitas. Well, the cilantro bolted WAY too quickly, the tomatoes have been slow to come in, and some of them having been rotting on the vines, the bell peppers are coming in one at a time and taking quite a while to get ripe and we're so overloaded with basil, beans and chard that I'm still not sure what to do. Needless to say, things aren't quite as I planned, and I have a few bags and containers of haphazardly stored veggies in the freezer because I just didn't know what to do with them. So, as you can see, you're right. I need help! I did have some success with stuffed squash the other day. I also made a bread/casserole with the leftover "stuffing" and a bruschetta with basil and cherry tomatoes. In the end, it wasn't so bad, but I was making it all up as I went. I'd prefer to have some idea of what I'm doing when I try something like that. For those of you who have freezers, here is a basic recipe for a crustless quiche. To the basic recipe, you can add whatever is in the garden that needs to be used. If you have chickens and a garden, you can make all sorts of quiches, bake them, and then freeze them. Defrost and bake for about 30 minutes at 350 degrees to heat through, and eat. 1 can Evaporated Milk 3 eggs 2 Tbs flour salt & pepper 2 cups of cheese, whatever you want, have on hand, or thinks goes well with the vegetatables. Mix well together, add sauteed vegeatables, and bake. Enjoy, either fresh or frozen and heated. 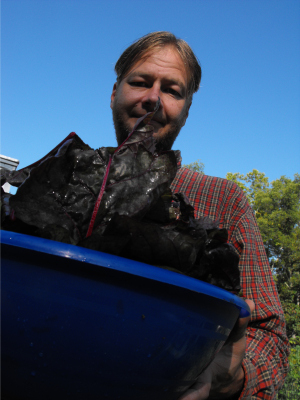 A friend gave me a huge bag of Swiss Chard, which looks like what Mark is holding, and some fresh onions. I cut the Swiss Chard in half lengthwise and then cross cut in 1/2" pieces. The onions I thinly sliced all white and some green parts. I saulted these to partially cook, then added to the quiche mixture. Put either in a casserole dish or in large muffin pans. Bake at 350 for about 45 minutes for a casserole or 30 minutes for the muffins. Cool, wrap, and freeze. You can use any combination of vegetables. Mmmmmmm, good! Did you plant the beans in the same pots (or the same dirt)? Diseases tend to build up in the soil, so I try to rotate and never put the same plant family in a spot for at least three years. Did you use the same soil mixture? Potted plants tend to be picky about their soil since they have so little space to grow their roots. In fact, unless you don't have any ground to grow in, I always recommend putting your plants in the ground and letting nature smooth out any problems you might have introduced. On the other hand, if your problem year was last year, it could have just been the weather --- it was a terrible year to garden with all of the rain. As for keeping notes, this is what I keep notes on: plant variety, date planted, date harvested, soil amendments (although sometimes I let this part of the note-taking slide), and where I planted each thing in the garden. I also keep track of how much it rains each day, and of the maximum and minimum temperature when my thermometer is working, although I don't really use the latter data. I don't actually have any trouble with small mammals because Lucy patrols relentlessly. Some people who have a lot of trouble with their seedlings being eaten start most of their seeds inside and transplant, but that sounds like a lot of work to me. You could perhaps build a little cage over your plants until they get big enough, or just throw a row cover over them. As for thinning --- I usually plant my seeds a bit too close because I figure some won't come up. When I weed them for the first time (a few weeks after I plant them), I'll go through and pull out the ones that are too close together (closer than the instructions on the seed packet mandate). Be aware that you can eat a lot of those thinnings, like carrots and greens! If you've got bad drainage in a container, you might want to repot. Be sure to use a good potting soil mixture, and good means loose and fluffy. I use stump dirt, but if you can't find an old tree you can buy fancy potting soil at the store, or make your own with a lot of vermiculite and/or peat moss mixed into soil and compost. Alternatively --- and I've never tried this --- how about throwing some worms in the pot and putting a bit of compost or grass clippings on top? I'd expect the worms to bring the organic matter into the soil and make worm tunnels in the process. Very good point about the herbs! Parsley has to be planted quite early, but is otherwise easy. Try again next year around the end of March and I'll bet you'll have better luck. I saw your stuffed squash on your blog and was appropriately jealous. We hope to eat our first summer squash this week, but our tomatoes are still weeks away. You might give Sheila's recipe a try for your chard, or wait for our ultra simple recipes for chard later in the week. I'm impressed by what you planted --- you picked quite well, and chose a lot of the plants I recommend for first year gardens. Thank you! Quiche is a great idea for using up just about any vegetable, and is very much in season right now, with the chickens still laying like crazy. I hope you'll jump in with more recipes as they occur to you. With both a CSA and a garden, we just have to resolve to eat what we've got! I make a lot of things that freeze well, though -- how nice it is to have cornbread and greens when the chard in the garden is long gone. Wow --- it sounds like you're overflowing with bounty! Sounds like you're going to have to find a huge freezer.